Protecting your feet is essential for any physical activity, which requires you to select the right type of shoes. Running and training shoes are two popular options that people use for a variety of activities. However, they are not interchangeable. Wearing the wrong shoes may result in unnecessary discomfort and increase the risk of injury. "Running shoes have a higher heel and a stiffer sole, whereas training shoes have a lower heel, softer sole and provide better lateral support. ​"
Although you can run in cross training shoes you wouldn't want to run a marathon in them and conversely if you are trying to do explosive lifts or high intensity body weight circuits a running show will probably be too soft. There are several differences between running and training shoes and they mostly revolve around the intended use of the shoe. When you run or jog, you engage in a lot of heel-to-toe movement. Running shoes are built to support this movement by offering more cushioning and a firmer sole. 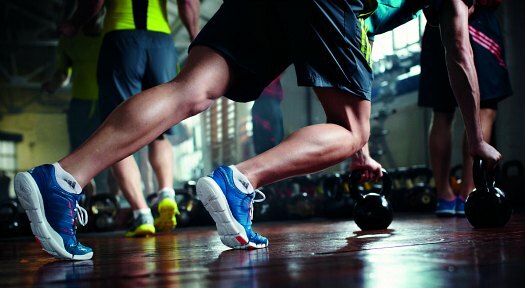 The best shoes for CrossFit are designed to accommodate the side to side movement that may be needed for a variety of activities such as aerobics, kickboxing, and weight lifting. Both types of shoes are flexible. However, they provide flexibility in different areas. With running shoes, the mid-sole tends to be more flexible while the sole is firmer, supporting the heel-to-toe movement. Training shoes offer more flexibility in the sole, allowing you to easily lift off in any direction. Training shoes tend to have wider, flatter soles to provide a more stable platform for your feet and offer more side support. The side support is necessary for the lateral movements used in almost any sport along with many types of gym exercises. The flat sole results in a lower heel and smaller heel drop. The heel drop is the difference in height between the toe height and the heel height. With a small heel drop, the sole is flatter. A small heel drop makes it easier to transition from squatting to standing, which is necessary when lifting weights or performing squats. You get more support for these exercises, placing less stress on your body. Training shoes typically offer more traction than running shoes. When you are running on a straight path, traction is not as essential. However, lunging to the side or suddenly shifting your weight while performing other activities requires a better grip. The grip also extends beyond the sole to the sides of the shoe, offering grip for climbing ropes. The weight of the shoes also varies. Training shoes are often heavier than running shoes, which helps with the overall stability and support of the shoes. Running is a high-impact exercise. While many cross-training exercises are high-impact, such as plyometrics, they are performed in short bursts. When you have long periods of high-impact exercise, such as running, your feet require extra protection. The extra protection is typically provided by more cushioning and shock absorption. A quality pair of running shoes should feel firm yet absorb most of the impact when your foot hits the ground. They should also have plenty of cushioning around the foot and in the insole. Running shoes also have a larger heel drop compared to training shoes, which means that the heel is thicker. These shoes typically have an eight-millimeter to ten-millimeter drop while training shoes may have a zero-millimeter to eight-millimeter drop. The bigger heel forces the heel to hit the ground first when running. This is the preferred choice for running shoes. However, some runners prefer a flatter shoe. Running shoes also provide less traction compared to a standard pair of training shoes. They still offer traction to prevent slipping on a wet surface but the treads are lighter. You do not need as much grip when you are mostly running on a straight path. Despite the extra cushioning and thicker heel, running shoes often weigh less than the training shoes. Shoe manufacturers use lightweight, breathable material throughout the shoe to keep your feet from getting too sweaty without reducing the cushioning. When Should You Wear Running Shoes? As the name implies, running shoes are best suited for running. Their main strengths include comfort and support. These shoes often have more cushioning and a flexible mid-sole. They are designed to keep your feet comfortable when running a long distance. Running shoes may also be worn in place of other athletic shoes. While there are walking shoes and various types of sneakers, some people find running shoes more comfortable when standing on their feet all day. When Should You Wear Training Shoes? Training shoes are intended for cross-training, which refers to training regimes that involve multiple types of activities such as weight lifting, cardio, aerobics, and CrossFit workout programs. These versatile shoes are also called gym shoes as they are suitable for almost any gym activity or sport. The one activity that they are not suited for is continuous running. The flatter sole and heavier weight may cause your arches to ache if you attempt a long-distance run. However, you can wear them for short sprints and warm-up jogging or running. These shorter activities do not require the extra cushioning provided by running shoes. Whether you are running or cross-training, your feet will get hot when wearing shoes that do not breathe well. Without breathable material, the shoes may also get musty and develop a permanent odor. To make the shoes more breathable, shoe manufacturers often use an upper mesh design along with the use of natural fibers such as cotton or canvas. The material should also be durable and able to withstand the abuse from constant exercise. The stitching is equally important. Even with durable material, the shoes may not last without quality stitching. However, these details are often difficult to determine without testing them yourself. Purchasing shoes from trusted brands and reading reviews can help you avoid inferior shoes that may wear out quickly. The next detail to examine is the sizing. Some shoes are slightly smaller or bigger compared to the standard shoe sizes. For example, if you regularly wear a men’s size 12 shoe, you may find that some size 12 shoes are too tight in the toes while others are too big. It is difficult to get the perfect fit without trying on the shoes and walking around in them for a few minutes. If you choose to order shoes online, you should test them out before wearing them outside. Walk around in them for several minutes to ensure that they fit properly. If you do not have a perfect fit, return them for the next size up or down. Whether you are running or cross-training, an ill-fitting shoe may result in blisters and sore feet. Most running and training shoes use shoelaces to secure the shoe around your foot. However, some people prefer Velcro. There are pros and cons to both options. With Velcro running or training shoes, you can quickly put your shoes on or take them off. They also offer a little extra support around the upper, which may help you feel more secure when cross-training. However, there is less room for adjustment. With shoelaces, you can adjust the tightness of the shoe in specific areas to get a custom fit. Adjusting the tension is a lot easier, thanks to the multiple eyelets that the laces pass through. Along with these details, you should pay attention to the features that are specific to each type of shoe. For example, when choosing running shoes, ensure that they have optimal cushioning. With training shoes, you should ensure that the shoes offer grip, support, and durability. There are many types of shoes designed for people with active lifestyles. These shoes are often built for specific types of activities. For example, running shoes are best suited for running while training shoes are intended for a versatile workout that involves a lot of different exercises. The primary differences between running shoes and training shoes are their flexibility, cushioning, and heel drop. Running shoes are flexible at the mid-sole, while training shoes have more flexible soles. Running shoes also have more cushioning and a higher heel drop, which adds support and comfort for long runs. With the lower heel drop, training shoes offer more stability for lateral movements. If you intend to do a lot of running, running shoes are preferred. However, when performing a variety of exercises involving side-to-side movement, training shoes give you the support that you need.